The loft Corcoran broker Laura Denise Milkowski was representing last fall should’ve been snapped up. It was an airy space on a prime Soho street, priced fairly at $4,500 a month. Would-be tenants came to weeks of open houses, but “they didn’t like the energy,” she remembers. “They’d walk in and say the place was off.” Maybe it was, maybe it wasn’t—but Milkowski covered her bets, consulting a healer who blessed and “cleared” the space. Then she worked on the apartment’s feng shui, rearranging furniture and adding earth-tone objects and a bamboo plant. “We rented it in under a week,” Milkowski adds. Of course, it’s of highly questionable utility, but an increasing number of brokers, when faced with a place that won’t sell, are taking a shot at improving its vibes. A new home is supposed to be a fresh start, after all. 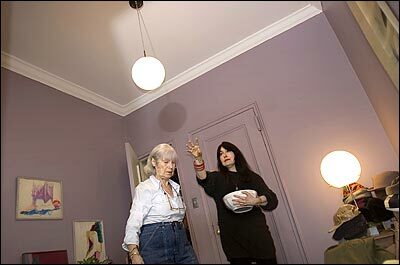 “People play out their dramas where they live,” says Melissa Stamps, a feng shui specialist (pictured, holding bowl, with client Maggie Vall). “You don’t want to walk into somebody else’s life circumstances.” In New York, where decades of drama are embedded in every wall, ritual cleansings to “purify” a space are important, says healer Sondra Shaye, who recently met with a group of Corcoran brokers to tout her services. Clients have lately been demanding such “spiritual insurance.” Nicole Wong of Century 21 William B. May reports that one seller insisted on leaving the fireplace grate and andirons to ensure good luck after moving. Wong also had to scramble this past January to get a contract signed by the 18th of the month, a number the homeowners deemed auspicious. “Of course, my clients were willing,” she says. “They really wanted the co-op.” Prudential Douglas Elliman’s Carolyn Zweben fields many requests to burn sage in clients’ apartments, a practice known as “smudging” that’s said to ward off evil. Her colleague Marcos Cohen remembers a Brazilian customer who insisted on putting aquariums full of fighting fish in all the rooms. “She said that would make the sale,” he says. That seller may have been onto something: Given the competitive market, brokers will try anything to get an edge. One agent confesses to reminding a rival bidder for an East 57th co-op that the apartment was on the fourth floor; he knew the potential buyers, who were Chinese, considered the number four a harbinger of death. “They never came back,” he says. We’d guess that Harvey Weinstein is expecting a large settlement once Miramax’s looming divorce from Disney takes place. Sources say that the Hollywood heavy hitter has just gone into contract for approximately $7 million for the 5,000-square-foot, three-bedroom apartment he has been renting over the past few months off Spring Street in Soho. 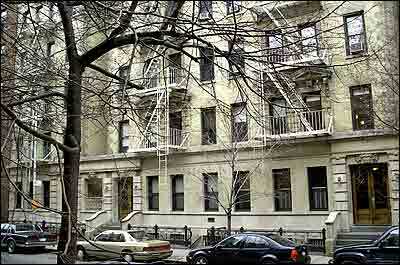 Weinstein is said to have fallen in love with the space while visiting former resident Nicole Kidman. He then rented it—paying upwards of $40,000 a month—when he split with his wife last year. Those who have seen the apartment say they’re not surprised the soon-to-be-unemployed mogul has decided to move in for good, describing it as one of the great spaces in New York. It’s not to be confused with the $6.3 million loft on Mercer Street, bought as an investment, that Weinstein recently put up for sale. Broker: Taryn Hammond, Century 21 William B. May. The prospect of a two-bedroom in Chelsea for less than $800,000 gets many buyers salivating almost as much as cupcakes from Billy’s Bakery do. But our panelists say this co-op is less scrumptious than it sounds: It’s less than 650 square feet, and the kid-size bedrooms are barely big enough for twin beds.